Quick. Richmond. What immediately comes to mind? Bad drivers? Yes, but that is too easy... Chaos? That too. Courtesy cars? But of course! Asian food? I think that would be the most appropriate and politically correct answer. So when a steakhouse tries to make it in the land of noodles and Dim Sum, it becomes a little bit of a curiousity. 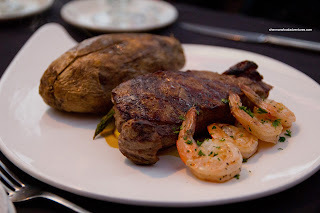 For me, I've already tried Chop located in the Sandman and although it was expensive, the steaks were pretty good. I had the opportunity to do a quick taste of the other steakhouse (Carver's) on the Richmond media dine-around last year. Of course that really didn't quality as an actual meal, so I was planning to return one day. Well, that day came when I spotted a deal on Travelzoo. I went ahead and purchased 2 vouchers and brought the whole family with me for some meat. Now one of the complaints of dining in Richmond is the parking or lack of. That apparently came to fruition here as well. Despite the provided parking pass, I was almost unable to find parking in, around and within the parkade. Finally arriving a bit late, we got down to ordering. 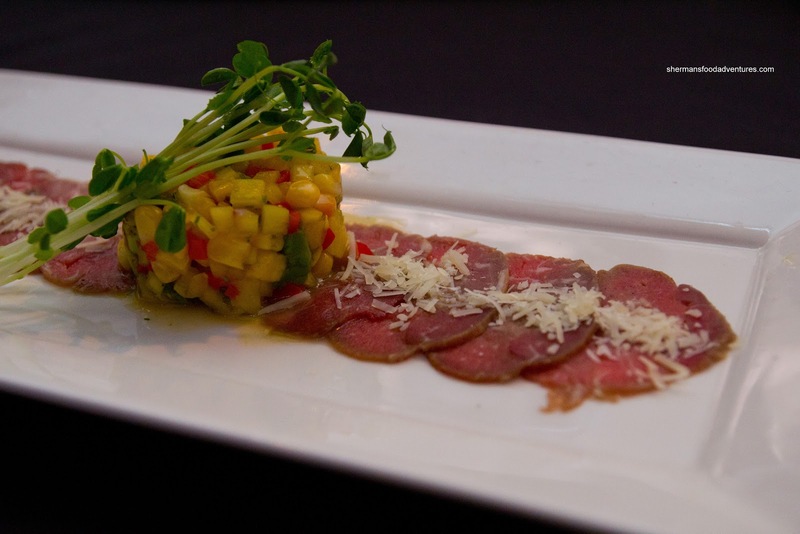 I started with the Beef Tenderloin Carpaccio with olive & truffle oil, smoked lemon juice, grana padano cheese and avocado salsa. Unlike the tasting, this time the carpaccio was a bit underwhelming in terms of flavour. I didn't get much of the truffle oil nor the lemon juice. I did, however, get enough of the cheese while the corn, red pepper and avocado salsa provided a brightness and sweet pop. Moreover, the beef practically melted in my mouth Seeing how that would be a "light" appie, I went ahead and got the Carver's Cheesebread for 2 as well. 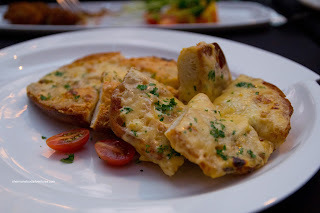 Despite the plethora of cheese and garlic butter, the bread itself was the weak link. It was too dense and got mushy from the moisture. This would've been far better if the bread was airy. Viv and my dad both had the Crab Cakes and when they arrived, we thought they were fried oysters. Unfortunately, this form of preparation really didn't do the crab cakes justice. I've had deep-fried crab cakes before (at the Crab Shack in Juneau) which were fluffy and delicious. These were neither. They were indeed crispy, but the exterior yielded to a dry and mealy filling. We really didn't like this dish. As a side, we got the French Fries and although they were crispy, there was nothing special about them. 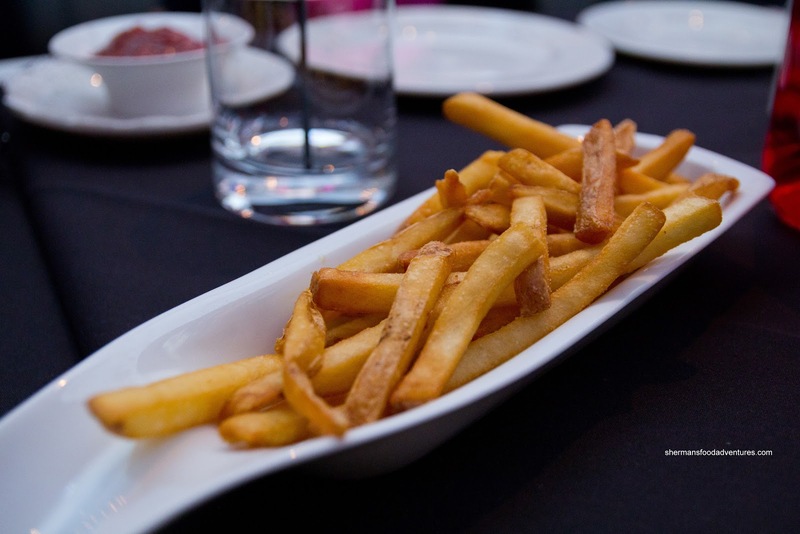 For a steakhouse, the fries should've been "better" than the usual generic GFS/Sysco-type frozen stuff we'd normally see in a cafeteria. Again, not bad, but pretty disappointing considering the venue. Okay, ignoring those aforementioned items for a sec, let's get to the meat (sorry for the pun) of the meal. I went for the Rib Eye and as you can clearly see, it was prepared a nice medium-rare. The meat was fairly moist and tender (as much a rib eye can get) and quite flavourful. I loved the "just-cooked" veggies underneath. As for the mash potatoes, it was a bit dense and could've been creamier. 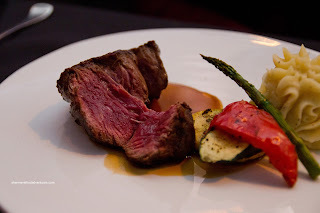 Viv's Filet Mignon was more on the rare side rather than medium-rare, but forgivable since the cut was quite thick. In the end, it was tender and moist. Of course it was not as flavourful as the rib eye due to the cut of meat. My mom went for the Striploin with Prawns and it was probably the least successful of the 3 steak dinners. 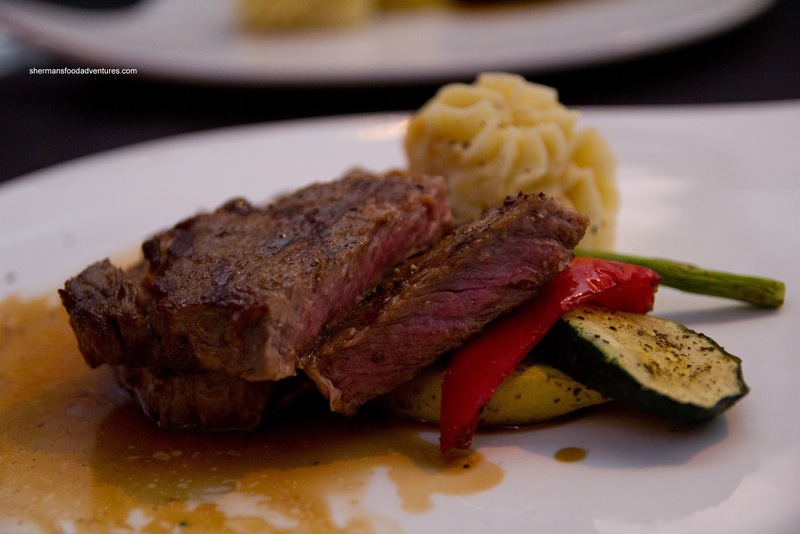 The steak itself was not bad, probably only a little past medium rare. But the prawns were a little strange. Sure, there was a cold-water texture thing going on, but the prawns were flavourless (probably too much cold-water rinsing?). Furthermore, there was no char on them whatsoever, which in turn led to underdeveloped flavours and appearance. My dad once again went the healthier route by ordering the Salmon. 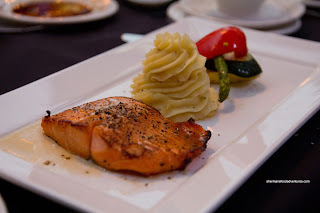 Yes, salmon in a steakhouse, not the best idea... Although the salmon was cooked through, it wasn't too dry. Yet, there was too much glaze which made it quite sweet. But then again, salmon in a steakhouse. We'll cut them some slack... The kids shared an order of Linguine with chicken in tomato sauce. 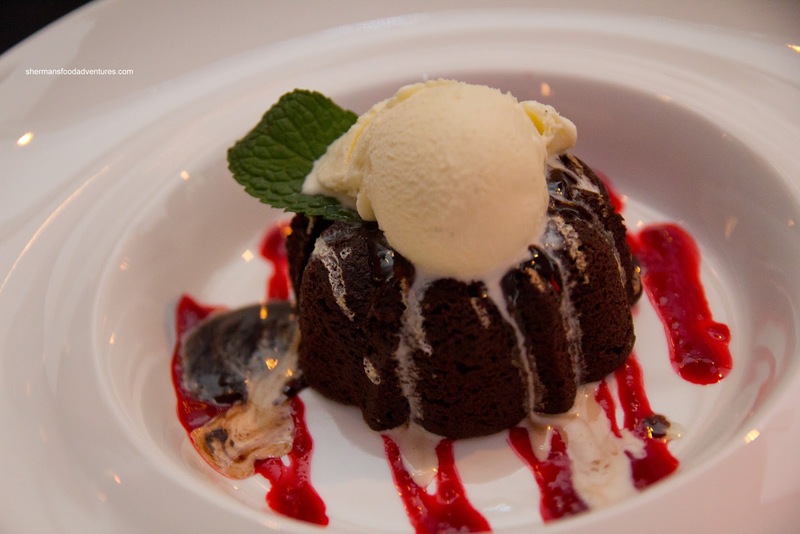 Since we were in Richmond, it was not surprising to see the noticeable sweetness in the sauce. 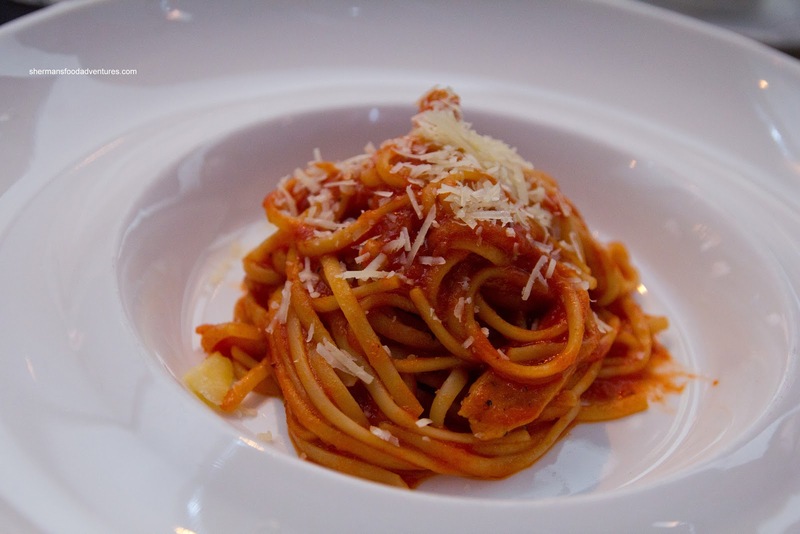 If you are familiar with HK-style cafe cuisine, the tomato sauce is generally mild and sweet. Well, this one was exactly that and who could blame them? They must cater to the locals and in this case, the kids didn't mind it. Onto dessert, Viv decided on the Molten Chocolate Cake with a liquid chocolate centre, raspberry coulis and ice cream with a white chocolate sauce. This was a pretty good version with a crispy exterior giving way to a fluffy interior. The cake itself wasn't super sweet, but could've stood to be more chocolaty. The liquid chocolate was also not super sweet. 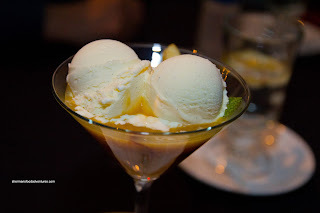 My mom had the Duo of Creme Brulee (Ginger and Green Tea). Okay, I can't really sugar-coat this (sorry for another pun), but there was no hard sugar topping on this "brulee". Honestly, this was a feeble attempt where they merely torched the top of a seemingly sugarless custard. Did they forget? Really too bad since the custard was decently smooth and had a nice consistency. It was also not super sweet and there was no mistaking the flavours. But yes, epic fail nonetheless. My dad had the Apple & Pear Martini which was naturally served in a martini glass. It was almost like a crumble without the sugary topping. I found the pears and apples to be nicely textured (where they were not mushy nor too firm), but the slices were too large and hard to scoop out. One thing I would've liked to see was more acidity as it was semi-sweet and not much more. Lastly, I had the Unbaked Cheesecake, which I ultimately ruined by spilling a whole glass of water on it. Yet, they cleaned it all up and insisted on bringing a whole new one out for me despite my clumsiness. 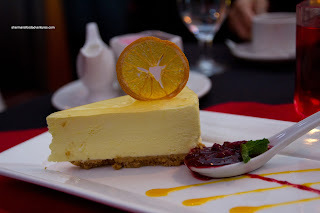 I liked the cheesecake for its silky texture and once again, controlled sweetness. There was enough tartness as well to balance it all out. Okay, this was a fairly hit and miss meal if I had to describe it. Now if we merely looked at the steaks alone (since it is a steakhouse), they were not bad. 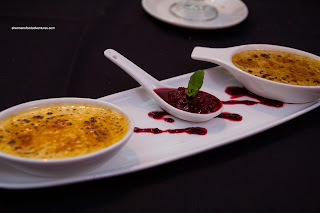 But in terms of everything else, there were some real duds (like the creme brulee and crab cakes) mixed in with so-so items. 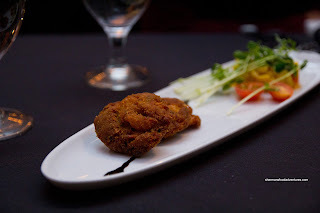 In the end, we didn't dislike our meal, especially with the level of service we received. 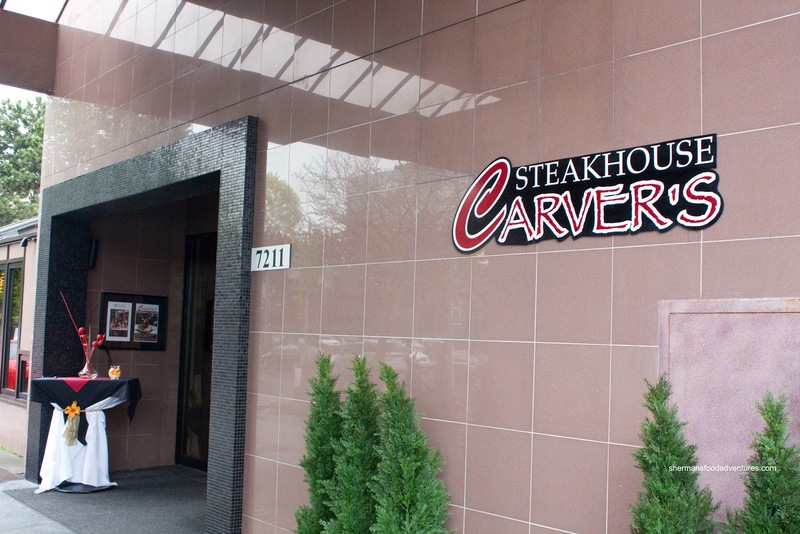 However, if I were to compare Carver's to other steakhouses in Vancouver, they may need to step it up a notch to compete. I think you are being too generous about their ability to get the steak right. A place of this price and caliber should get their steaks perfect! @Shannon You're right. I am too soft that way. But in the end, the food was subpar. Won't being going back.